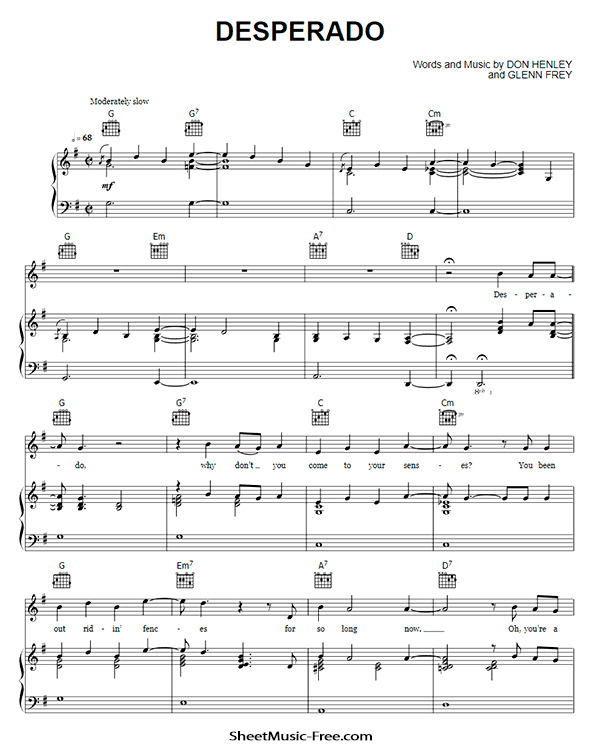 “Desperado Sheet Music” by Eagles, “ Desperado Sheet Music” for Piano / Vocal/ Chords Guitar , Original key: G Major, number of pages sheet music PDF: 4, Video and Lyrics song Desperado Sheet Music. “Desperado” is a ballad by Eagles, an American rock band, written by group members Glenn Frey and Don Henley, and sung by Henley. It first appeared on the 1973 album Desperado, and has later appeared on numerous compilation albums. According to Don Henley, the song was based on something he wrote in 1968 with a different title, but the same melody and chords. You’ve been out ridin’ fences for so long now.” Jackson Browne had suggested a Western theme for the song, and Frey then helped with the lyrics and gave it structure, and the song became “Desperado”. Henley said of the writing of “Desperado” with Frey: “And that was the beginning of our songwriting partnership … that’s when we became a team.